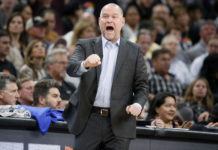 After spending over a week in San Diego for training camp and two preseason games, it seemed as if time on the road finally caught up with the Denver Nuggets… until it didn’t. After trailing by 11 at half and by as many as 18 in the second half, the Nuggets competed an incredible comeback victory defeating the Los Angeles Lakers by a score of 113-111. After opening preseason on Sunday with a 124-107 victory over this very same Lakers team, the Nuggets followed it up with an even more impressive performance, this time by the comeback variety. In a game full of so many ups and downs, lets take a look at five takeaways from the Nuggets’ second preseason victory. For a team that relies so heavily on their offensive production, the Nuggets struggled to score the ball with any type of efficiency. After going just 2-for-15 from three and shooting just 34 percent from the field in the first half, the Nuggets trailed 59-48 going into halftime. Starting in the place of an injured Jamal Murray (ankle), who was held out for precautionary reasons, Monte Morris drilled the Nuggets’ first three of the night midway through the second quarter. Morris got the Nuggets’ offense back on track and did a solid job filling in for Murray in his 26 minutes of action. As far as the rest of the starters go, Jokic played phenomenal, scoring 20 points on 7-of-10 from the field, 2-for-2 from behind the three point line. Jokic and Morris combined to score 32 points on 12-for-22 from the field and capped off their solid nights with this highlight-reel play midway through the third quarter. Of the remaining starters, Will Barton, Paul Millsap, and Torrey Craig combined to score just 17 points on 4-26 from the field. 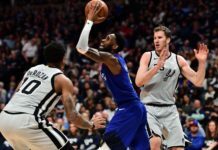 Barton’s 1-for-12 from the floor was the most eye-popping of the three, and is a bit of a concern after he shot 3-for-9 in the preseason opener. Again, the Nuggets were without two starters in Murray and Gary Harris (hamstring strain), but the struggles offensively just go to show how important those guys are to Denver’s offensive success. Jokic was easily the Nuggets’ best player Tuesday. Not only did he score the ball efficiently in the post, but he also drilled each of his three-point attempts. After struggling to shoot the ball from distance in the Nuggets’ preseason opener (0-3), Jokic looked more confident and comfortable with his outside shot tonight. Jokic also flashed his passing and rebounding ability, as he led the Nuggets in rebounding with six while also dishing out four assists. No assist was more special than this one at the end of the first half – with a little help from Paul Millsap’s full-court dime and Barton’s shot-making ability. It might have just been the second preseason game, but it was great to see Jokic take over the game and get back to his dominant ways. Some of the Nuggets’ rotation minutes are up for grabs, but there’s no doubt who will be the Nuggets backup center this season: Mason Plumlee. For the second straight game, Plumlee flashed an ability to be an effective player off the bench, while effectively working within the Nuggets’ second unit. After going for 11 points, eight rebounds, and six assists in the Nuggets’ first game, Plumlee followed it up with an even better performance, scoring 23 points on 11-for-11 shooting from the field. The reverse jams were in full effect, as Plumlee’s big second half helped reinvigorate the Nuggets’ offense. If Plumlee is able to add consistent offensive production off the bench, it’s only going to help the Nuggets’ improved second unit. The starters didn’t do the Nuggets any favors with their lackluster game offensively, but Denver’s bench unit was there to pick up the slack. Led by Plumlee’s big night, Trey Lyles and Malik Beasley posted solid performances for the second straight game. Combining to score 27 points, Lyles and Beasley were huge players in the Nuggets’ 18-point second half comeback. For a player fighting for rotation minutes, Beasley has showcased a confidence that could be huge in him earning extra playing time moving forward. As a player who brings defensive energy off the bench, Beasley’s offense has been the greatest part of his game though two preseason games after going 7-of-10 from behind the arc in the first two games. If Beasley’s three pointer is able to complement his defense, it could give the Nuggets another useful weapon off the bench this season. The other bench player who really shined for the Nuggets was Donald Sloan, who scored 12 points and hit a big three-pointer in the final minute of the game to give Denver a five-point lead. Filling in for Morris as the backup point guard, Sloan played well for a guy on a training camp contract who’s trying to prove his worth not just to the Nuggets, but the rest of the NBA. The only bench player who really struggled was Juancho Hernangomez, who followed up a 19-point performance with zero points Tuesday. Juancho took just just two shots in his 26 minutes of action, and was never able to get in a rhythm like he did in the Nuggets’ opener. 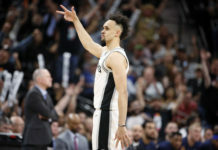 Trailing by as many as 18 points in the second half, the Nuggets didn’t bat an eye as they completed a major, comeback victory in a hostile environment. It might be the preseason, but in this situation that doesn’t matter. 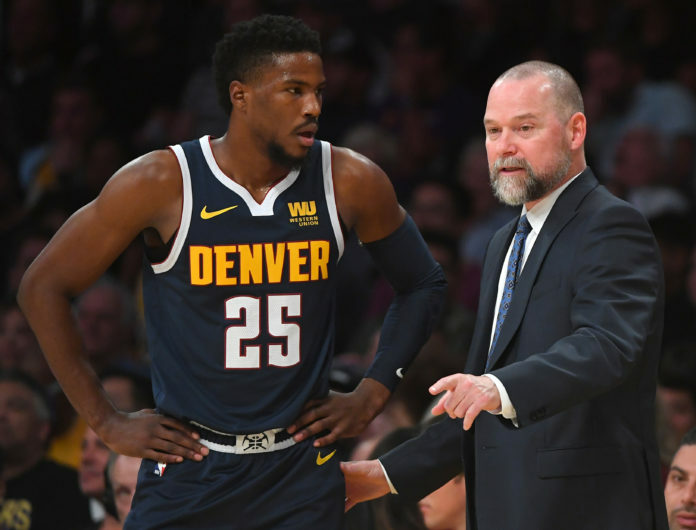 For a team that hasn’t made the playoffs in five seasons you want to see fight when things aren’t going your way, and the Nuggets showed just that. The Nuggets are now 2-0 in the preseason as they head home to face the Perth Wildcats Friday night at the Pepsi Center.